Kubernetes has become the de facto standard today for building and running container workloads. Many organizations would like to leverage their existing investments in VMware to take advantage of the Kubernetes revolution. Unfortunately, VMware was never designed to run containerized workloads. Furthermore, Kubernetes is complex and notoriously difficult to deploy and operate at scale for production workloads. The lack of Kubernetes skills adds to the challenge. Join us at 1 PM EST/10 AM PST on February 21, 2019 to learn more. Organizations can leverage containers for digital acceleration and to simplify application development. As environments scale and grow, managing all the containers becomes increasingly difficult. This is where Kubernetes can help. Platform9 Managed Kubernetes enables organizations to get value from containers, fast, with container orchestration delivered as a service. 1. Manage and monitor Hybrid Clouds: Manage environments that consist of on-premises, public and private clouds. 2. Cloud-native application development ensures consistency: Leveraging containers and Kubernetes ensures consistency in application development and deployment. 3. Compute resources at the edge: Organizations are finding more and more need for resources to be closer to where information is generated for faster analysis. Join us to learn more about these uses cases! Organizations are moving to cloud to increase operational efficiencies and revenues, and most are using more than one. A hybrid cloud or multi-cloud environment can help organizations advance their digital transformation strategy, but if not properly planned, it can lead to a complex environment. Platform9’s centralized management plane transforms your existing IT infrastructure to leverage a cloud model while making it easy to incorporate public clouds as business requirements change. Join us on October 16th at 10 AM PDT! Serverless Computing offers an incredible opportunity for business to accelerate innovation and reduce operational costs – both for greenfield applications, as well as for established organizations with legacy applications and technical debt. In this talk, we will discuss 3 key uses cases primed for Serverless, and share design patterns and tips to allow you to take advantage of Serverless in your organization, today. We will cover Serverless as a ‘strangler’ pattern for modernizing monolithic, legacy applications and infrastructure. Event-driven processing: from fraud detection, transaction processing, mobile apps, IoT sensors, etc. Batch and real-time big data augmentation/data exposure. Cloud Native (CN) application development is emerging as the most important trend in digital platforms and one that ultimately determines business competitiveness. What makes this paradigm so challenging is that the application itself is designed for scalability, resiliency, and incremental enhance-ability from the get-go. The fundamental truth is that not only will this change how your infrastructure is provisioned & deployed but also how it is managed.Cloud Native applications need to be architected, designed, developed, packaged, delivered and managed based on a deep understanding of technologies such as Docker & Kubernetes. We will highlight disruptive & validated architectures that leverage Kubernetes, Hybrid Cloud and Fission "FaaS". We will also discuss what forward-looking organizations should be cognizant of while embarking on an enterprise CN strategy. Choosing amongst various cloud solutions can be a daunting task - deploying those solutions can be even more difficult with considerations to be made on many moving parts: hardware, software, technical expertise, budget availability, timelines, and much more. In this webinar, we’ll focus on a popular open-source cloud computing solution, OpenStack, and how a SaaS model to deployment can be beneficial for IT environments of all sizes. Fission is a framework for serverless functions or Functions as a Service (FaaS) for Kubernetes. It allows users to run FaaS on any infrastructure. Fission exposes a conceptually simple interface: Users create _functions_ and associate them with _triggers_. Functions are short-lived and stateless, and are written in any supported language (NodeJS, Python, Go etc). Triggers invoke functions: they can be HTTP requests, timers, or other events. 1. Developer workflows: function versioning, unit testing, upgrades. 3. Mixing serverless and more conventional designs as part of a real-world solution. This webinar will explore the use of Kubernetes across on-premises and cloud environments for high availability, disaster recovery, or cloud bursting. Bich Le, Founder and Chief Architect at Platform9, will walk you through Kubernetes Federation for hybrid cloud environments and its importance in your cloud and containerization strategy. You will also get a peek into Platform9 Managed Kubernetes' current capabilities and future roadmap. 1. What are some hybrid cloud and multi-cloud use cases? 2. How does Kubernetes federation support those use cases? 3. What is Platform9 Managed Kubernetes and how does it take advantage of Kubernetes federation? Picking up where our last container-focused webinar, "Learn How SaaS-Managed Kubernetes Takes Containers to the Next Level", left off, Bich seeks to provide more visibility on the path down containerization. In this webinar, he'll go over deploying Kubernetes on-prem vs public infrastructures, walk through cluster creation, and how to dynamically expand the capacity of an on-prem cluster with public cloud resources. Join Platform9 and Datera to learn how their software solutions can provide the DevOps agility, and operational simplicity of the cloud for containers. Mainstream adoption of stateful applications have been foundational for containerized applications to get widely deployed. With Datera Elastic Data Fabric and Platform9 Managed Kubernetes, customers can manage any application on Containers. Container technology is hot and evolving every day by leaps and bounds. Just why are containers so attractive and how are they different from VMs? To add to the confusion, complex container environments need orchestration solutions, such as Kubernetes, to be managed effectively. There are a few different ways to deploy these solutions, each with their own drawbacks and benefits. In this BrightTALK session, we'll take a look at containers, container orchestration, and walk through a real-world application that shows why containers are leading the way. 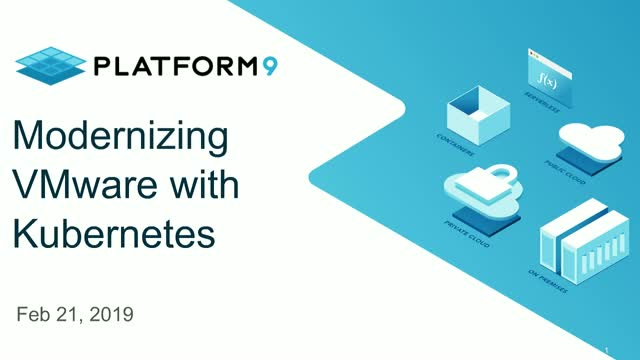 Platform9's co-founder and Chief Architect, Bich Le, walks us through containers, the need for orchestrating them with Kubernetes, and how a managed solution benefits developers. Hybrid cloud environments are the future for many enterprises: the ability to combine a private cloud with multiple public cloud providers, for different types of workloads, can mean cost savings and agility. In a hybrid cloud world, having a common API layer will be critical for seamless consumption of these clouds without settling for the lowest common denominator among them. OpenStack can be that API layer since it is open and widely supported by enterprises and vendors. In this webinar, we will discuss hybrid cloud use-cases and show how OpenStack can be used to manage hybrid cloud. We’ll also demo a solution that can discover running VMs, AMIs and VPC in Amazon Web Services and make them available for self-service via OpenStack. What if there's a faster and easier way to manage cloud infrastructure across multiple platforms and save up to 70% of IT costs? Learn how best-of-breed cloud infrastructure, like OpenStack and Kubernetes, can be SaaS-managed to reduce cost and time to value, all without lock-in to a single vendor ecosystem.This helps DevOps and IT teams focus on solving core business problems while automating much of the set-up and management process on the back end. Platform9 will speak from experience of enabling customers, like Box, Blue Cross Blue Shield and PlayStation, to realize a greater than 99 percent success rate with OpenStack projects. In private clouds, multi-tenancy can be both a blessing and a curse. It's a blessing to be able to manage a wide variety of applications and customers in a completely automated fashion, but a curse for storage administrators who have to deal with an unbalanced set of I/O workloads and the nightmare of provisioning thousands of LUNs into an end-user-controlled wild west of environments while still maintaining high service levels. In this webinar, you will learn about the importance of storage automation in OpenStack and how to deal with mixed workload environments using techniques such as Quality of Service, cache manipulation, automated storage management, and how SSD is transforming the data center. In this webinar, we’ll discuss how to avoid common pitfalls when standing up OpenStack and share real stories about how other companies have successfully installed or upgraded their own instances in less than 20 minutes using existing infrastructure, without downtime. Why? OpenStack held the promise of creating an AWS-like cloud inside an enterprise datacenter. Its value is to provide APIs and self-service to DevOps team and make it easier to deploy virtual infrastructure and application stacks. So, what happened? Even among OpenStack enthusiasts, it is clear that it takes a lot of effort to install and upgrade OpenStack in a production-ready configuration. It’s been difficult from the get go to hire OpenStack experts, onboard existing brownfield environments and configure a multi-region, multi-tenant OpenStack deployment. Then there’s the need to implement comprehensive monitoring and alerts, patch critical bugs as they are discovered, and occasionally upgrade the entire installation; without severely impacting uptime. While some big enterprises may have gotten it close to right, the vast majority of IT teams that want to install or upgrade OpenStack are too scared to do it. OpenStack doesn’t have to be hard. With the right tools, it isn’t. We are on the cusp of a new era of application development software: instead of bolting on operations as an after-thought to the software development process, Kubernetes promises to bring development and operations together by design. This new open source container cluster manager provides platform automation for deployment, scaling and management of application containers and clusters. With declarative, infrastructure-agnostic constructs to describe how applications are composed, interact and managed, Kubernetes promises an order of magnitude increase in operability of modern software systems. Join Sirish Raghuram, Co-founder of Platform9, the company enabling SaaS managed Kubernetes anywhere, to discuss why Kubernetes matters, and the advantages it can provide to DevOps. Platform9 enables DevOps teams to be up and running in minutes with open source frameworks such as OpenStack and Kubernetes. Our managed services provide extreme ease of use, coupled with production-ready SLAs for cloud infrastructure.